Kemp ISD has adopted a no nits/lice policy. Students who are identified as having nits/lice will not be allowed to attend school or ride the bus until cleared by the campus nurse. Head lice, although not an illness or a disease, is very common among children and is spread very easily through head-to-head contact during play, sports, or nap time and when children share things like brushes, combs, hats, and headphones. If careful observation indicates that a student has head lice, the school nurse will contact the student’s parent and inform the parent that the child will need to be picked up from school and to discuss a plan for treatment with an FDA-approved medicated shampoo or cream rinse that may be purchased from any drug or grocery store. After the student has undergone one treatment, the parent should check in with the school nurse to discuss the treatment used. The nurse can also offer additional recommendations, including subsequent treatments and how best to get rid of lice and prevent their return. It is easy for someone to become infected with lice and often very difficult to get rid of them, unless you follow the complete treatment listed below. Home treatment of this condition can be rapid and simple. Machine wash and dry, on hot temperature, all clothing and bedding. Place stuffed animals in plastic bags for 10 days and then remove and vacuum or wash in hot water and dry in dryer. Clothing or bedding that cannot be washed may be dried in the dryer on high for 20 minutes. Vacuum furniture and carpet, also inside of vehicles. Boil combs, and brushes 5 minutes or soak one hour in the solution used to treat the hair. Make sure you do hair bows etc. Check all family members. Use the same treatment on anyone else having lice. 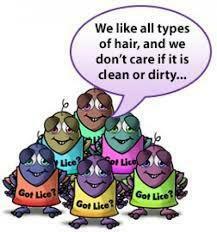 Unless the whole family is FREE OF “NITS” OR LICE AT THE SAME TIME, YOU WILL CONTINUE TO HAVE A PROBLEM. If your child sleeps with another family member treat that person also, whether he/she has nits or not. Instruct your child not to use anyone else’s hat, cap, scarf, coat, comb, brushes, or hair bows etc. as lice are easily transmitted this way. Repeat the shampoo treatment in 7-10 days. 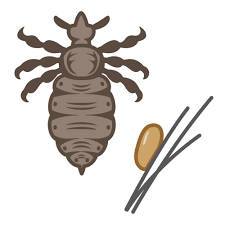 While the medication rapidly kills crawling lice, it does not kill the nits (lice eggs). All nits need to be removed. Blow drying hair twice a day also helps in reducing nits. READ DIRECTIONS CAREFULLY, SOME MEDICATION GOES ON DRY, WHILE OTHER MEDICATIONS ARE APPLIED TO WET HAIR.